CO 30 sts with 7 mm straight needles, using violet yarn. Work in garter stitch for 13 rows. - place 30 sts from the straight needle onto the 8mm circular needle (make sure you have the marker after 15 sts), pick up 7 sts on one side, pick up 15 sts, place 2nd marker, pick up 15 sts, pick up 7 sts on the other side. Put a crochet hook into the first st, then into the second st and into the back of the stitch you can see inside the bag three rows below - catch and pull the yarn out through all those three stitches, drop two stitches from the needle. Put the formed stitch back on the left needle and repeat the procedure - in this way you attach the tunnel edge to the inside of the bag. When you bind off all the stitches, with a crochet hook make a chain and attach it next to the place you've started it - it'll make a closure. With a violet yarn, attach four D-rings to the edge of the bag. Make a chain with a crochet hook 55 cm long. 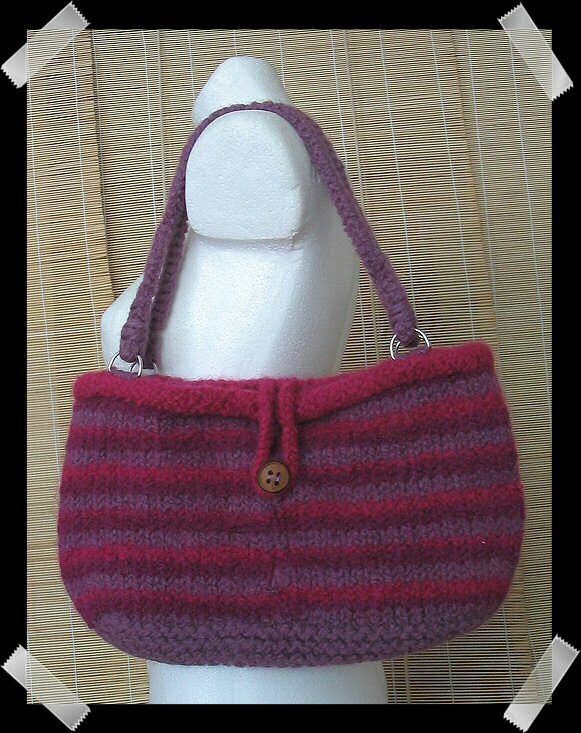 Then crochet it back and you have one handle ready to attach to the D-rings on the bag (make two). With a crochet hook, attach the yarn in the middle of the top of one side of the bag and make a chain 25 cm long, attach it right next to the place you've started it.